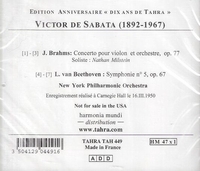 “Although he was a composer and a violinist and pianist of virtuoso caliber, Victor de Sabata (born Vittorio) was best known as one of the world's leading conductors, particularly of Italian opera. During the first few years of his career his concentrated on composition. His opera IL MACIGNO (The Rock) was premiered at La Scala in 1917 and was frequently played during the next few years. Arturo Toscanini (who frequently performed de Sabata's tone poem JUVENTUS of 1919) encouraged de Sabata to consider a conducting career. He began to conduct in 1918, but continued composing as his conducting career gathered steam. He wrote several other orchestral works, mainly with an intriguing mixture of Romantic-era Italian lyricism and dramatic episodes. He soon became the conductor of the Monte Carlo Opera. With that company he gave the world premiere of Ravel's L'ENFANT ET LES SORTILÉGES in 1925. His first performance in the United States was with the Cincinnati Symphony in 1927. He conducted that orchestra through much of 1929, but left to assume a post at La Scala in Milan, débuting there in 1930 with Puccini's LA FANCIULLA DEL WEST. He remained affiliated with La Scala to the end of his life. He concentrated on a broad spectrum of the traditional repertory, plus modern composers like Stravinsky, Debussy, Ravel, Puccini, Sibelius, Strauss, and his Italian contemporaries. He was active as a guest conductor, appearing at the Vienna State Opera in 1936 and the Berlin Philharmonic in 1939. He became closely associated with Wagner's TRISTAN UND ISOLDE, leading him to be invited to conduct in Bayreuth in 1939. After World War II he resumed his international touring. He led a special series of all the Beethoven symphonies in 1947 with the London Philharmonic, brought the La Scala company to Britain in 1950, conducted 14 concerts in March, 1950 with the New York Philharmonic in Carnegie Hall, and conducted in several other American cities. He was known for a precise ear and original interpretations. He had the elasticity of tempo characteristic of the Romantic era. This rhythmic freedom and his unusual interpretations caused him to be criticized in later years as eccentric, which bothered him. Ill health caused him to give up regular conducting in 1953, but not before he led one of the all-time classic opera recordings, Puccini's TOSCA, with Callas, di Stefano, and Gobbi. His conducting at the funeral of Toscanini on 18 February, 1957, was his last performance. He remained associated with La Scala as artistic superintendent from 1953 until his death." "Tahra is a tiny classical music record company based in rural France. It's run by Myriam Scherchen, daughter of Hermann Scherchen, who co-ran the music label Tahra, which released officially authorized historical recordings of conductors such as Scherchen, Furtwängler, Mengelberg and others, generally drawn from primary recorded sources. Tahra ceased business after the death of the co-principal of the label, René Trémine. And despite its small size, the label has won some of the classical music industry's most prestigious awards, outgunning many of the big multinational conglomerates that dominate classical music today. Tahra's records are historical recordings, often taken from 78s or tapes of decades-old radio broadcasts."